Please don’t call it “ANWR.” The Arctic National Wildlife Refuge is not an acronym. We don’t refer to Yellowstone as “YELL” or Central Park as “CEPA.” By reducing it to four letters, the oil industry hopes you’ll forget that this place is a refuge that belongs to all of us. Conservationists have won the fight to keep oil drilling out of the Arctic Refuge more than fifty times. But in conservation, you only get to lose once. The tax bill passed by Congress late last year has four pages of detail designed to circumvent environmental laws and expedite oil drilling in the Refuge. Why should you care? Because the Arctic Refuge, along with other wild places from Acadia to Zion, is your land. The places we choose to protect tell the story of who we are and what we value. This administration is circumventing the will of the American public in the biggest public lands scandal since Teapot Dome in the Harding era. Oil development in the Arctic and mining in Bears Ears will benefit corporations, not you. The nation is not so desperate that we need to get our oil from the Arctic Refuge. The United States is now the world’s second largest exporter of petroleum products. If we drove 5% less or 5% slower we could save more oil than by drilling in the Refuge. Destroying our wild heritage to get oil is akin to burning the heirloom furniture just because we are too lazy to close the windows. 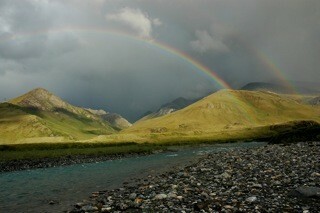 I have visited the Arctic Refuge every year for the past 32 years. I keep going back because it one of the few places left on Earth that is still intact. When you stand on the coastal plain of the Arctic Refuge you see a sweep of the Brooks Range a hundred miles in each direction as Lewis and Clark experienced approaching the Rocky Mountains for the first time in the 1800s. This is the wild America that shaped our character and our destiny. Don’t trust Alaskans to do what is best for the Arctic Refuge. Alaska is a bought-and-paid for banana republic. We Alaskans pay no taxes and we receive our annual permanent fund pay-out thanks to Big Oil. Of course we Alaskans want to get our hands on Arctic Refuge oil – it puts more money in our pockets. Alaska’s politicians have fought against conservation at every step since Jimmy Carter signed the Alaska National Interest Lands Conservation Act in 1980. And let us never forget the hellish 1989 Exxon Valdez oil spill that showed us the true risks of oil development in Alaska. We can reverse this craven Congressional mistake, but our work just got much harder. We will need to fight hard to change our politics in 2018 and then replace this giveaway with a wilderness designation. If the bulldozers start up, we will be there physically to greet them. In the meantime, drive slower and drive less. If the price of oil stays low, Big Oil can’t afford to drill in the Arctic Refuge. We all have our sacred places. The Taj Mahal, Notre Dame Cathedral, the Grand Canyon, the Arctic Refuge. We may never set foot in them, but these places offer us spiritual refuge even from a great distance. The Arctic Refuge is still here for you, but Congress just gave away the keys to the sanctuary. Brad Meiklejohn is Alaska State Director for The Conservation Fund, where he has worked since 1994. Brad has directed conservation projects protecting over 300,000 acres of wild land in Alaska, New Hampshire and Nevada. Brad is also the President of the American Packrafting Association, with over 2,000 members in 30 countries. Brad is a conservationist, birder and wilderness explorer and has completed packraft expeditions on 6 continents. Brad served as Associate Director for the Utah Avalanche Center during the 1980’s, and as President of the Patagonia Land Trust. Brad is a past board director of The Murie Center and the Alaska Avalanche School. An earlier version of this editorial ran in the Los Angeles Times. Please, Rewilding Earth readers, borrow from this or draft your own comments; and submit them as soon as possible through BLM website at www.blm.gov/alaska or email to blm_ak_coastalplain_eis@blm.gov. See www.alaskawild.org for additional information on where and when to write our government officials; and support Alaska Wilderness League’s defense of wildlands. If you are near Washington DC, please attend the public hearing there at the National Housing Center, 4:30-9 PM. Arctic National Wildlife Refuge provides home for great herds of Caribou, families of Grizzly Bears and Gray Wolves, the rare and elusive Wolverine, migratory salmon and char, and globally significant concentrations of waterfowl. Arctic Refuge is one of the last places on Earth where large animals in Pleistocene abundance still find room to roam. Most famously, the Porcupine herd of Caribou calves on the Coastal Plain, where energy development is proposed. Energy exploitation in Arctic Refuge thus could mean the end of one of North America’s grandest wildlife concentrations. The Arctic Coastal Plain, where energy exploration is proposed, is the most ecologically-sensitive and biologically-rich part of the Refuge. Energy sprawl here would mean habitat fragmentation, likely leading to invasion by exotic species, diminished habitat security for wide-ranging species, severing of travel routes for migratory species, and altered microclimates; pollution, from spills, exhaust, and use of toxic chemicals; erosion and melting of permafrost, with attendant deleterious effects on plant communities and streams; and outright displacement and killing of wild animals and plants. The Rewilding Institute also opposes energy extraction in the Beaufort and Chukchi Seas. Again, these Arctic ecosystems are rich in wildlife and sensitive to disturbance. Fossil fuel extraction needs to be phased out everywhere, so that atmospheric carbon levels can be brought back down to livable levels – which many scientists suggest are about 350 parts per million, or about 50 parts per million below where we are now (and rising at least a part per million per year). Removing carbon from the ground in Arctic regions to burn and thus put into the air is at least doubly damaging, for Arctic regions are warming faster than the rest of the globe and proving especially sensitive ecologically; and the very foundation of Arctic ecosystems, frozen ground, is undermined as permafrost melts. We as a nation must learn to leave carbon in the ground, and meet our energy needs through conservation, population stabilization, efficiency, and small-scale renewable energy. Finally for now, Arctic National Wildlife Refuge is among the premier wildlife watching and wilderness travel destinations in the world. Many of us at Rewilding Earth have enjoyed some of our most fabulous wilderness outings on paddling and hiking trips there. Our country would be terribly foolish to squander this immense recreational and ecological value for a few months worth of fossil fuels. We have no choice but to transition away from fossil fuel burning – which is already dangerously overheating the biosphere. Let’s make that transition well before we’ve ransacked our greatest wildlands. Beyond just protecting all of Arctic Refuge as Wilderness, The Rewildng Institute advocates phasing out exploitation in the misnamed National “Petroleum” Reserve of Alaska and joining it to Arctic National Wildlife Refuge to form an international peace park. The resulting National Pleistocene Reserve, with indigenous communities but no industrial exploitation, would be the grandest protected area on Earth and a model for how humans might relearn to co-exist with the natural world.